» NEW JERSEY: THANKSGIVING DAY TROOP SUPPORT Warriors' Watch Riders: WE HAVE YOUR BACKS AT HOME! It was another fine day to live in the land of the free and home of the brave. About ten WWR family members met for breakfast, joining us were members of the Legion Riders as well as our extended family from The Yellow Ribbon Club. After breakfast, back outside, more of the faithful joined our cause for the day. We made the easy ride over to America’s Best Value Inn, the host for Thanksgiving Dinner for 200 National Guard members from Georgia and Tennessee. These people were being bused in from Ft. Dix, NJ. They had no clue what was in store for them on this day. They were told they were going to Philadelphia for the day. It’s a great thing Eric Spevak, our host for the day, does for troops at Ft. Dix on Thanksgiving. He’s an individual who never served in the military, but is a true patriot and wanted to help out in some way. He coordinates this effort with the host hotel, the base, LEO, the caterer, politicians, etc. 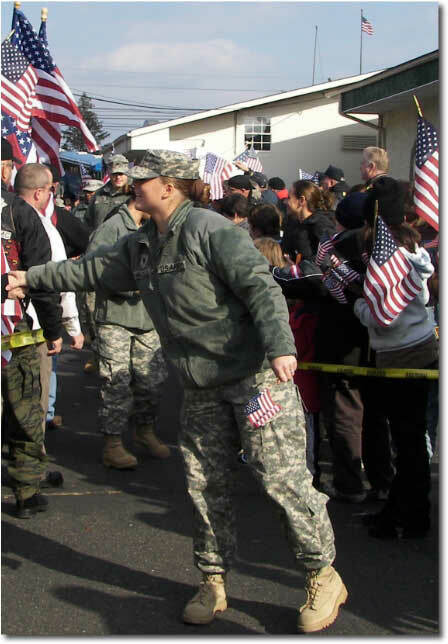 When the buses pulled in and the troops unloaded there were at least two hundred people waving flags, holding signs, cheering, shaking hands, slapping backs, etc. A handful of politicians, state and federal, G-Cobb of Eagles fame, the Commander of JWV Post 126, and some higher up military officers were all on hand. Oh yeah, and lots of biker scum were there too. While this event has been held several years now, this was the first time that group leaders from the various organizations present got to go inside and see the program before the meal. The leaders of each group- Nam Nights, POW/MIA Awareness, Yellow Ribbon Club, SJ Riderz, Garden State ABATE, Last Patrol, WWR, and a couple more I’m forgetting, were led to the middle of the floor. Spevak told those gathered how many members of these groups are veterans, Vietnam Veterans. And how they came home to much different circumstances. Mention was made how these groups don’t want what happened to our Vietnam Vets, when they came home, happening to anyone ever again. The politico’s each had a turn at the mike and received applause for their speeches. But when Spevak asked for the group leaders to be acknowledged, an enthusiastic extended standing ovation was given. While it was kind of warm inside, especially since we still had our biker garb on, I felt bad for the Nam Nights leader standing directly in front of me, because he was even sweating from his eyes. Not being a vet myself, I had goose bumps watching this appreciation bestowed to these men. I was in Awe. Thank you to all who came out for this, in person and in spirit. It was a good thing, for a good cause. And to do it on Thanksgiving Day made it even better. No user commented in " NEW JERSEY: THANKSGIVING DAY TROOP SUPPORT "